This morning, On the way back to Shelter Island, where I am now, I stopped at Ralph's Grocery to get orange juice and eggs. 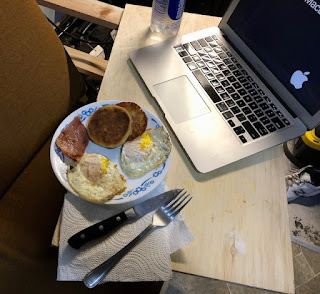 For breakfast, I prepared 2-eggs over easy, Mimi's ham, English muffin. Nature's Head is the cat's meow! It takes very little maintenance. About once every 4-days the Urine bucket needs emptying. Every 4-weeks, the sphagnum moss which processes #2 needs changing. Today I dumped the used sphagnum moss and bought fresh moss at Home Depot. I'm interested to see how box van works out in terms of stealth. 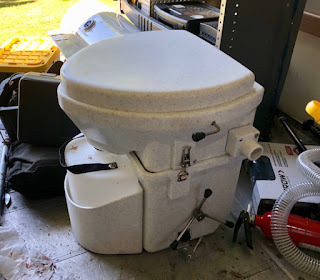 This could be a winning venture. I like what you've done so far. Wish I had your talents with wood. I find the sequence of these to blog entries very interesting.